At courts across Greater Palm Springs, the growth of pickleball has seen a dramatic rise in popularity in recent years. Mirroring the sport&apos;s rapid rise across the nation, the game with the funny name now has approximately 3 million players in the U.S. and about 6,000 courts across the country (a doubled total from as recently as 2010). Here in the desert, the game&apos;s influence can be seen across the nine cities, with myriad clubs and multiple municipalities transitioning tennis courts into pickleball venues, whether for temporary or permanent play. 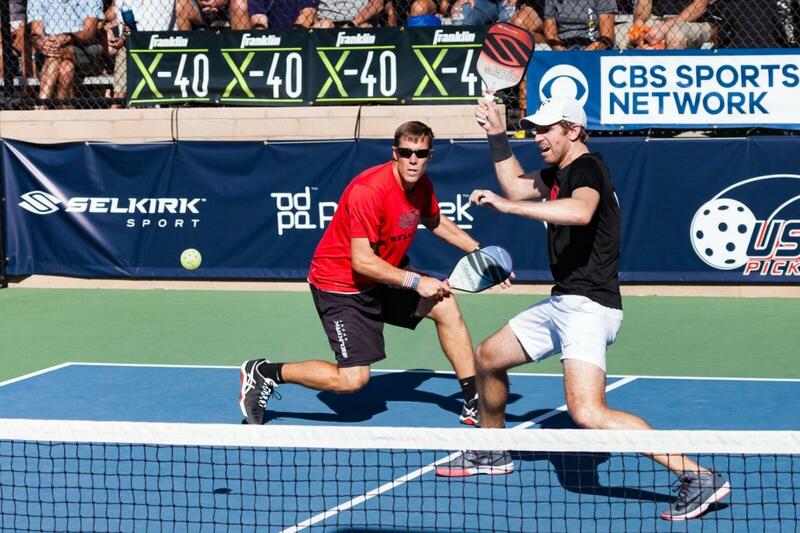 Further enthusiasm in the valley was cemented with the announcement that, from November 3-11, 2018, the famed Indian Wells Tennis Garden (IWTG), home of the annual BNP Paribas Open, will convert 12 of its playing surfaces into 45 Pickleball courts to host the Margaritaville USAPA National Pickleball Championships. While the game has been around since the mid-1960s, pickeball&apos;s rise has, in part, been the result of a maturing tennis population; it&apos;s estimated that three-fourths of pickleball players are age 55 and older. Enjoyed for its fast points and pace, pickleball is generally referred to as a hybrid game of ping pong, badminton and tennis, with a composite paddle as the player&apos;s tool. Played on a badminton-sized court (20 feet by 44 feet), pickleball differs from badminton not merely in the use of a wiffle-style ball in lieu of a birdie, but with net heights of 34-inches at the center. Akin to tennis, players serve diagonally (and underhanded) to the opposite court, with the ball required to bounce once per side before volley begins; on both sides of the net, a "non-volley zone" marks an area where players may only hit a ball after it bounces. Singles and doubles games are both in play (though the latter is more popular), with games generally played to 11, win by two; points are only scored by the serving side. A best-of-three sets format is the norm, with matches typically going no more than 90-minutes. As for attire, while many players don tennis-style garb (skirts and tennis dresses are popular for women), the game&apos;s social and casual aspect proves a dressed-down affair for most. Greater Palm Springs boats a host of pickleball playing opportunities across both private clubs and public parks. Previously held across multiple sites in Arizona since 2009, the transition of the annual Margaritaville USAPA National Pickleball Championships to Greater Palm Springs should prove a boon for local enthusiasts and competitors from across the world. The initial agreement between the Garden and United States Pickleball Assn. (USAPA) is for five years. Evidencing the allure of the premier, single-site setting at the Indian Wells Tennis Garden, The Desert Sun newspaper reported that participant registration for the Championships reached its 2,000 player limit in one day, though updated participant numbers suggested that approximately 2,500 players will compete in the event. The growth in the game&apos;s popularity can further be seen via the head count at last year&apos;s Championships, which, according to The Desert Sun, hosted a then-record 1,300 participants. To welcome the world&apos;s largest pickleball tournament, played across nearly 140 different professional and amateur divisions, the IWTG has repainted a dozen of its 28 courts into 45 pickleball courts (with most of the courts transferred back to tennis after the Championships, and far in advance of the BNP, held March 4-17, 2019). The event&apos;s Championship Court will have space for 3,000 spectators, and the tournament will also provide food, drink, vending and daily entertainment. Attendance is free, though there is a charge to view matches on the Championship Court. For tickets, please click here. And for those not competing in the Championships but eager to enjoy the game amid the world-class environs, fear not, the IWTG does offer seasonal pickleball play; please click here to learn more.